What's painted on the canvass of YOUR life? Perhaps it would help to know the Painter first. ​If you or a friend wants to increase your general knowledge of the Bible's basic truths, then this class is for you. Bible Information Class reviews the beliefs of our church as based on the Bible. It also informs you about being a person who is close to God: how did it happen? What difference does it make? ​The ABC's of the Bible in an easy to follows style! ​The class will meet once a week using the Bible as the answer book. Pastor Schroeder encourages life-related discussion and offers you every opportunity to ask questions and explore without obligation. Small comfortable group setting that is ideal for getting your questions answered. ​​To register for class, please call fill out the form below, call the church office at 209-551-0563, or email Pastor Schroeder at dan7schroeder@gmail.com. 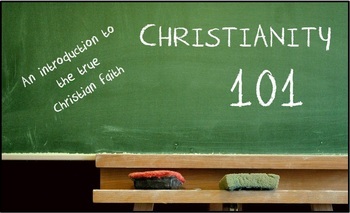 Our next session of Christianity 101 will begin Thursday, September 13, at 6:30pm. You are welcome to attend even if you will be unable to attend every lesson. If you are interested in attending Christianity 101 please fill out the following form and we'll contact you to confirm you will be attending.